When does a fad become something more? Every year new ideas, styles, colours and flavours emerge. Some of them stick around to change the sport for the better—think rocker shape to skis nowadays. Others not so much—we’re looking at you, SnowBlades. Here are the ones to watch this year. Walking around the halls of the SnowSport Industries America (SIA) Snow Show, the giant annual ski and snowboard product release party, it doesn’t take long to realize that men dominate. And that goes for everything, from sales reps to company owners to even women’s gear. The reality remains that men design most “women-specific” skis. There are exceptions of course. Since the late ’90s, the K2 Ski Alliance, a group of female skiers who come from a wide range of backgrounds, have helped design, influence and test the brand’s female-specific skis, including three new all-mountain boards: LuvBoat 105, FulLUVit 95 and AlLUVit 88. Almost every other brand has similar feedback relations with their female athletes. From a cult trend around Ontario private clubs, down-filled shorts are spreading to the rest of the ski world, keeping great bums warm everywhere. Marmot keeps the idea subtle with removable down shorts built into its Cheeky Pant. On cold days the shorts add a nice hug of warmth, especially on unpadded chairlifts. When the thermometer climbs, unclip the shorts and let the flattering Gore-Tex pants do its thing. Meanwhile, SKHOOP is staking its name on the fashion statement with insulated skirts in a variety of colours. New this year is the Supreme Thermiun Short Skirt. Made from waterproof-breathable Gore-Tex, it’s ideal for wet-coast, er, west-coast skiers wanting to keep their butts dry while sitting on soggy chairlift seats. Sporty winter skirts can also be found at Helly Hansen, Mountain Hardwear, LaSportiva and SWIX. You know that feeling when the sun suddenly goes behind a cloud and you can’t see the moguls at your tips? Well, a new breed of goggle lens hopes you never do again. These one-quiver goggles will adjust to huge extremes in light intensity within a second. UVEX claims the speed record with its Snowstrike VT goggles. The electronic crystal lens changes tint in 0.1 seconds. Zeal unleashes its AUTOMATICPLUS+ lens on several of its goggles, promising enough fast adjustment and light range to make fog-day goggles obsolete. Ski graphics are a form of fashion statement and some brands take their artistic expression further than others. Every year Icelantic Skis pieces the graphics for its skis from artwork created by co-founder Travis Parr. For instance, this year Parr painted a fantasy mountain scene that was deconstructed for the graphics of the freeride Maiden and Nomad skis. Line the boards up and the artwork reappears. Prior taps its local community for inspiration. Every fall the Whistler-based manufacturer runs a topsheet contest in the Sea to Sky to find new art for its custom-ordered boards. Atomic team rider Chris Benchetler creates the new art for his signature ski’s graphics every year. Likewise, designer and freeskier Eric Pollard of Line skis put his creative touch both inside, in the design, and outside, on the topsheet, of half a dozen models, including the Pandora 110. And it’s not just skis. BUFF is getting artsy, too. The wear-it-12-different-ways neck warmer/toque, is partnering with snowboarder and graphic designer Android Jones for a line of original artwork BUFFs. And finally, the brush strokes decorating Krimson Klover’s baselayers are hand-painted, and its merino wool Ski Top Village series are drawings from resorts the company owner has visited. While snowboard and AT boots walk almost as well as they carve, ski boots only do one thing well. But bootmakers are trying to change that. Lange’s Walk to Ride, Fischer’s Walk Sole and Marker’s Grip Walk are similar sole designs that borrow the lugged and rockered soles of backcountry ski boots without impacting the DIN performance of alpine bindings. They won’t make stairs much easier, but the hike from the parking lot should be less clunky and slippery. At the SIA show we heard it over and over from just about every ski brand. The buzz phrase this year is “swingweight.” Basically, how heavy the tip and tail of a ski are dictates how much energy it takes to turn it, which can make our legs tire earlier and ultimately affect our fun on the slopes. Swingweight matters. Honeycomb tips in the Rossignol 7-Series kick-started the trend, and Rossi continues to reduce weight, even as it updates and stiffens the 7 and Experience lines. Now almost every brand is following suit. Some mill out the material from the centre or edges of the ski, while others sub in lighter alternatives or ditch cosmetic topsheets. Kästle even punches holes in the tip. However they do it, the idea is the same. Making skis lighter and easier to turn makes skiing less tiring and more fun. When it comes to boots that don’t fit, it’s not usually the soft mouldable liner but the stiff plastic shell at fault. Looking to eliminate the crude contraptions bootfitters use to deform shells to fit, brands are coming up with high-tech and more customizable solutions. New this year, Nordica dealers can use InfraRed Shell Customization. The suitcase-sized kit uses a hand-held heater and suction cups in various sizes and shapes to adjust only specific problem areas, rather than the whole boot. For its Vacuum Fit boots, Fischer uses a proprietary plastic with less memory, so after heating and pressurizing the shell to form to an individual foot the plastic holds its new, custom shape better. Preferring to create an explosive first impression, Dalbello uses C4, pre-punching four known problem areas in its Avanti AX boot. If it doesn’t fit perfectly right out of the box, it soon will with its heat-mouldable liner and shell. 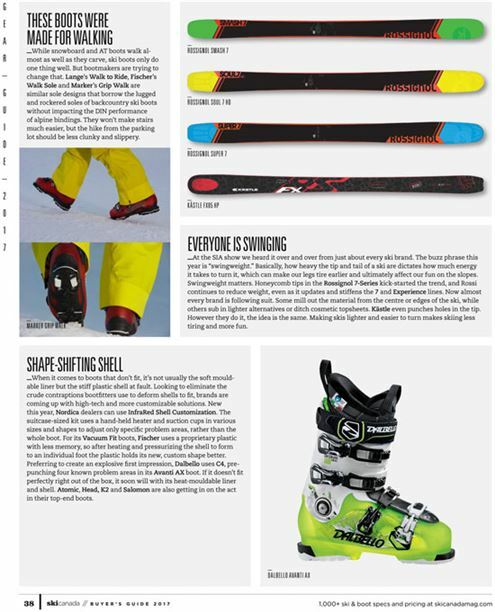 Atomic, Head, K2 and Salomon are also getting in on the act in their top-end boots. Humans have been using flax for at least 30,000 years, mostly for making linen textiles. More recently the health-food industry fell in love with the little seeds because they’re high in omega-3s. 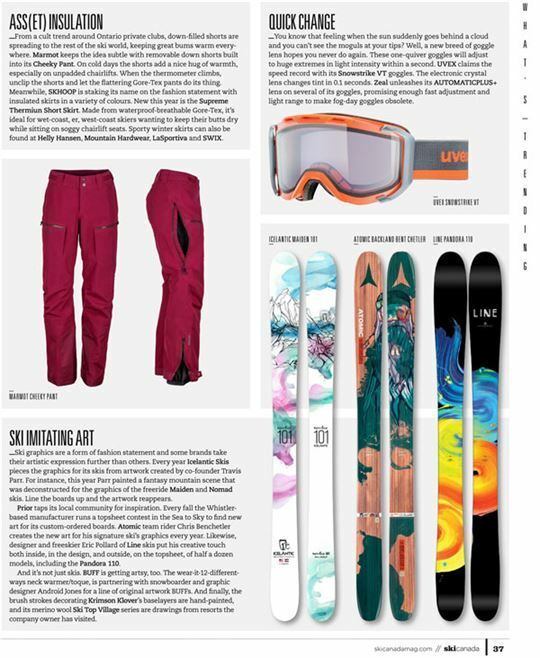 Now skimakers are embracing flax for its smooth and stable ride. Salomon first introduced it in its backcountry skis, and is now expanding flax use to its eight-ski QST line. 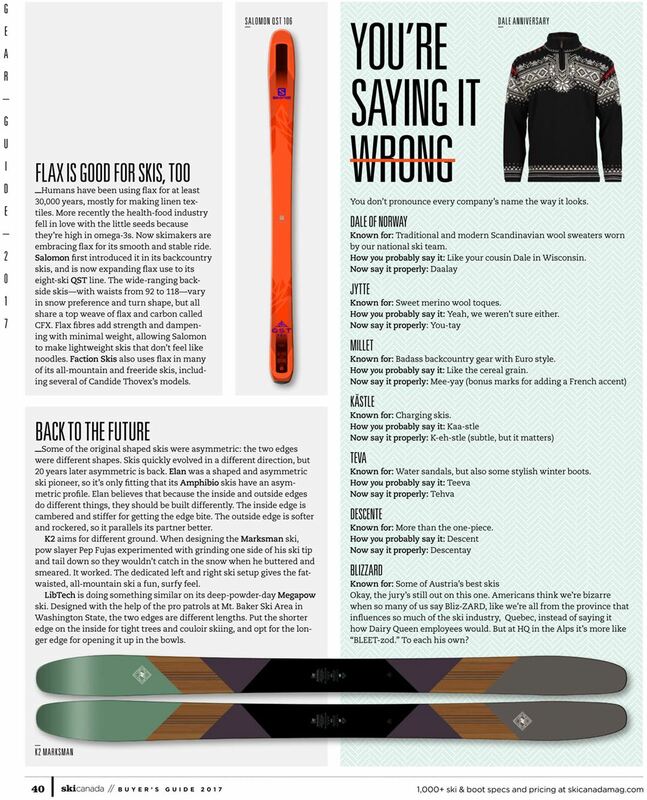 The wide-ranging backside skis—with waists from 92 to 118—vary in snow preference and turn shape, but all share a top weave of flax and carbon called CFX. Flax fibres add strength and dampening with minimal weight, allowing Salomon to make lightweight skis that don’t feel like noodles. Faction Skis also uses flax in many of its all-mountain and freeride skis, including several of Candide Thovex’s models. Some of the original shaped skis were asymmetric: the two edges were different shapes. 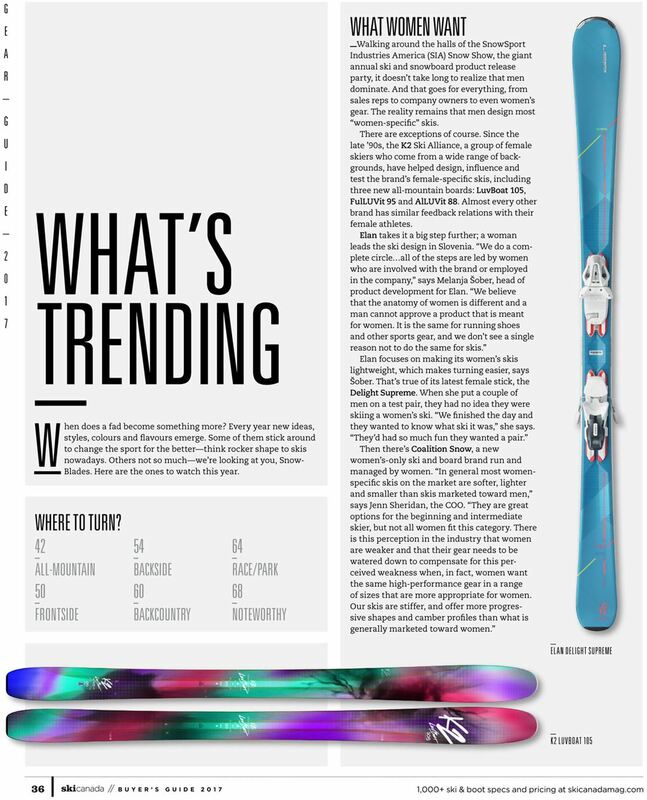 Skis quickly evolved in a different direction, but 20 years later asymmetric is back. Elan was a shaped and asymmetric ski pioneer, so it’s only fitting that its Amphibio skis have an asymmetric profile. Elan believes that because the inside and outside edges do different things, they should be built differently. The inside edge is cambered and stiffer for getting the edge bite. The outside edge is softer and rockered, so it parallels its partner better. K2 aims for different ground. When designing the Marksman ski, pow slayer Pep Fujas experimented with grinding one side of his ski tip and tail down so they wouldn’t catch in the snow when he buttered and smeared. It worked. The dedicated left and right ski setup gives the fat-waisted, all-mountain ski a fun, surfy feel. LibTech is doing something similar on its deep-powder-day Megapow ski. Designed with the help of the pro patrols at Mt. Baker Ski Area in Washington State, the two edges are different lengths. Put the shorter edge on the inside for tight trees and couloir skiing, and opt for the longer edge for opening it up in the bowls.